Three Matadors — Allison Bird, Amanda Derzy and Robert Ahn — were part of the Golden Globes social media team on Jan. 7, working to announce winners and to post other content throughout the event. Bird and Ahn were interns; Derzy, who interned last year, was invited back to be assistant manager of social media. Here, they pose in the middle section of the red carpet shortly before celebrities began arriving. Shortly before the Hollywood Foreign Press Association began live streaming the official Golden Globe Awards® pre-show, two California State University, Northridge film students and one recent graduate wandered the red carpet, taking in the scene and, of course, posing for pictures. The three Matadors—current seniors Robert Ahn and Allison Bird, along with December graduate Amanda Derzy—were at the Jan. 7 ceremony in the Beverly Hilton Hotel working to ensure the success of the official @goldenglobes accounts for Twitter, Facebook and Instagram. Ahn and Bird were interns; Derzy, who interned last year, was invited to return to serve in a more expanded managerial role. Technically, the purpose of their red carpet trip was to introduce themselves to security and familiarize themselves with the layout to inform the captions they would write for a barrage of posts throughout the evening. But they were aware of the coolness of the opportunity, and they made Instagram “boomerang” videos to prove it. The CSUN internships, now in their second year, are a recent addition to a long-running partnership between CSUN and the HFPA. In January 2016, the HFPA escalated its support with a $2 million donation to enhance technology in CSUN’s Department of Cinema and Television Arts and help create the HFPA scholars program, in which students receive sizable scholarships and are mentored by CTVA faculty and industry professionals. 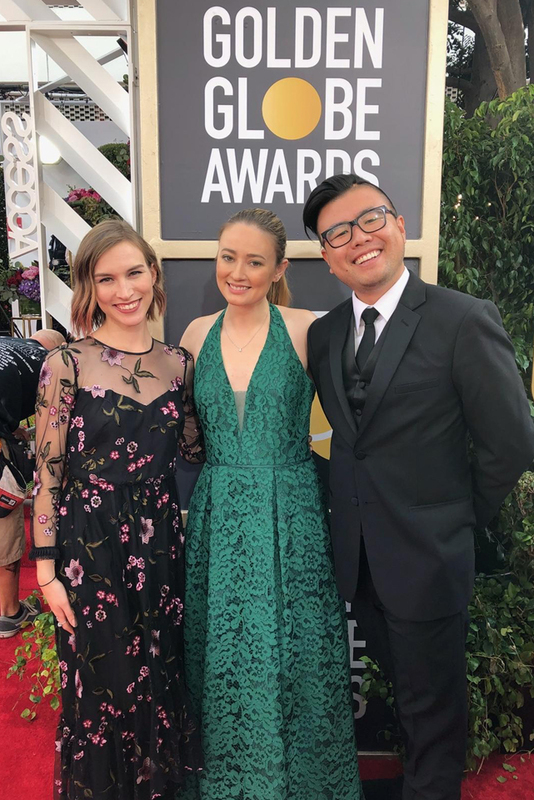 The CSUN staffers played a key role in a high-pressure, fast-paced job: as members of the social media team for the Golden Globes, they wrote, edited and fact-checked photos, videos and written content for the official Golden Globes social media accounts before and during the ceremony. They had to get through Facetime interviews and a social media test to ensure they had the chops for such a high-profile responsibility. Derzy was one of two CSUN students who interned for the Globes in 2016, and did such an excellent job that she was invited back and promoted to be a right-hand woman to the social media team leader. Ahn and Bird were recommended to the HFPA by CSUN cinema and television arts (CTVA) professor Nate Thomas. Ahn, a senior film production major with an emphasis in editing, runs the social media account for CSUN’s Career Center. He’s also a 2017-18 HFPA Scholar, so he was happy to pay them back in this small way. Bird, a senior film production major, impressed while serving as a photographer at the naming of a Manzanita Hall wing in honor of the HFPA wing in September, beating a quick deadline from The Hollywood Reporter trade publication. The students documented the pre-ceremony events, such as the unfurling of the red carpet and a media luncheon on Jan. 4. Video from the carpet unfurling came from Ahn’s phone, and Bird took a lot of the photos that were posted. The students were each given a small allowance by the HFPA to make sure they dressed appropriately for one of Hollywood’s highest profile events. Ahn rented a tuxedo, while Bird and Derzy rented dresses, Ahn said. During the ceremony, the CSUN students were in a command center nicknamed the “war room” in a second-floor room overlooking the red carpet. With the window open, they could hear photographers shouting for the attention of arriving celebrities. At the same time, photographers on their team were sending up images to be selected and posted. Derzy said they tried to pick the most interesting, compelling, statement-making pics — what would their friends want to see? A no brainer was photos of (arguably more famous) adults geeking out over the Stranger Things kids. “It’s cool to see celebrities get starstruck,” Derzy said. The CSUN interns also were responsible for posts announcing award winners, which had to be done nearly instantaneously even though they didn’t know the winners until the announcements onstage. Faces had to be identified correctly, names had to be spelled correctly and the appropriate, verified social media accounts had to be tagged. The interns and other members of the social media team (which included veteran freelancers and HFPA employees) spent days before the ceremony researching nominee spellings and verifying social media accounts, and preparing spreadsheets of content for a wide range of predictable award outcomes. Bird’s research started as soon as she was selected a few weeks before the ceremony. Any mistakes would be seen—and likely called out—by more than 2.6 million followers on Facebook, plus more than 1 million more on Twitter and more than 900,000 on Instagram. The eight-minute speech, given as Winfrey accepted the Cecil B. DeMille lifetime achievement award, was a rare break in the broadcast where no award winners were announced. Although they were removed from the stars for most of the ceremony, at the end of the event they did find themselves shoulder-to-shoulder with several stars in the hotel lobby. “We went home with memories we’ll treasure long after we graduate,” Ahn said.